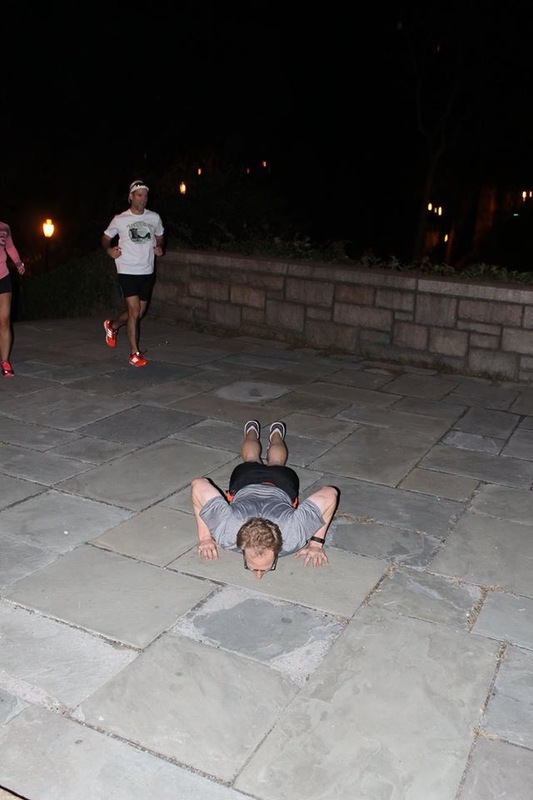 10/21/2015: Morning Workout, November Project, 5:28 a.m.: It’s a Long Fly Ball! Taper time is slow time. With no workouts on Monday and Tuesday, I almost didn’t know what to do with my life. The next 11 days before the NYC Marathon are going to drag! Good thing I had November Project NYC to enjoy this morning. I woke up at 4:30, strapped on my workout and bike gear, and rode over to East End Avenue and 86th Street. I crossed the 72nd Street transverse in Central Park and rode up East Drive to 84th Street, and then across to the East River. I had never visited the Park that early, and it was dead quiet. Eerily quiet, especially after Sunday’s 22-mile run through the crowds of beast cancer walkers. Once I returned to the City streets on the East side, however, cars flew past and I had to wait at stop lights. At 5 a.m. What a contrast. In honor of the Mets’ strong postseason run, our workout was baseball-themed. We broke into teams of six or eight, and then split into groups of three. We then played two “innings” of baseball. Group 1 began by running suicides on the basketball/hockey court next to our staging area. Each “player” started on the base line, ran to a line at the top of the key, did a pushup, ran back to the baseline, then to the center line, did two pushups, back to the baseline, then to the far key, three pushups, back to the baseline, all the way to the far baseline, four pushups, then over to the benches next to the court for four dips, and then back to the baseline. That scored one “run.” Repeat for 7.5 minutes. Group 2 began by running a grotto/stair loop with one burpee to cap it off. That scored one run. To score a second run, each player had to run two stair loops and do two burpees. For a third run, three stair loops and three burpees. Repeat for 7.5 minutes. Group 1 and Group 2 switched workouts. Scoring runs before the sun. Group 1 returned and performed suicides, but did squats instead of pushups, and step-ups on the bench instead of dips. This was supposed to last for 7.5 minutes, but we somehow kept going for over ten. Group 2 returned and performed grotto/stair loops, but did Coopers (a burpee with straight arms and a higher jump) instead of burpees. Groups 1 and 2 performed the opposite workout. Overall, it felt great to be outside in the near-60 degree weather. it was also fun (in a sadistic way) to do suicides, something I haven’t done since high school hockey practice. I definitely held back in order to preserve myself for the marathon, but I felt tired and ready for a nap afterward. Riding my bike home after the workout felt good. I ran about 3-3.5 miles throughout the workouts. At lunch I hit the gym later to stretch and to do some core work. I generally follow this core routine, and threw in a 75 second plank for good measure. My stretching included moves to stretch my piriformis, IT bands, hip flexors, quads, glutes, and hamstrings. Definitely do not want any injuries creeping up before the marathon! For the rest of the week, I will be running another 15-18 miles (including a longish run of 8 miles on Sunday), and spending the rest of my time reading recaps of past NYC marathons, race strategy guides, and trying not to talk excessively about the marathon. Woot! So pumped. ← So Much To Catch Up On!